A man walks in the Al-Aqsa compound as a heavy sandstorm hits the Old City of East Jerusalem, Sept. 8, 2015. Much has been written on the Sykes-Picot Agreement of 1916 between the United Kingdom and France, and much came as a result of this meeting, namely the fall of the Ottomans. What would also later come as a result of this agreement was a statement of British support for "the establishment in Palestine of a national home for the Jewish people" in the form of the Balfour Declaration of 1917. The fall of the Ottoman Empire was not only a result of European imperialism; in 1916, with the encouragement and support of the U.K., which was fighting the Ottomans in World War I, the Sharif of Mecca led a revolt against the Ottoman Empire to create an Arab state. Although the revolt failed in its objective, World War I resulted in the end of Ottoman suzerainty and control in Arabia. The fall of the Ottomans meant a majority-Muslim world devoid of unity and hierarchy, leading many into a forced participation in World War II as a result of colonization, the theft of natural resources, resistance movements seeking independence from European imperial powers and finally the establishment of new modern nation states. In 1948, the Zionist settler colonial state was established in Palestine, and history notes this as a direct result of European imperialism doing what it did best, divide and conquer. Since then, much has changed, but what has not is the continued inculcation of the majority of the international community into solidarity with the Palestinian resistance movement and standing for the oppressed; Muslims worldwide are certainly a part of this community. The two wars of 1967 and 1973 under Egyptian leadership and the banner of the Pan Arab liberation movement participated by a host of Arab armies were an attempt at regaining the stolen land. But for Muslims, this is not only primarily because of Jerusalem and the surrounding areas' religious significance as a holy land; it is more so as a result of what is seen as a religious moral obligation to stand for the oppressed, no matter the cause and no matter the populace. It is this same moral obligation that demands international attention on the current Saudi state. The colonization of much of Africa and Asia in the 20th century, including most of the Muslim-majority world, was brutal and paralyzing; the consequences are still felt today. In addition, the colonizing powers were, among many things, oppressive, unjust and non-Muslim. The focus of the worldwide Ummah, or Muslim community, was rightfully fixated on attaining freedom from the foreign entity. All the while, the Al Saud family had established self-rule, gaining independence in 1932 and establishing Saudi Arabia. It was the Al Saud's rejection of the Ottomans and consequent dealings with the British that resulted in their independence. Former colonial territories in Africa and Asia would not gain independence until the 1950s and 1960s, but it was the Saudis who gained sovereignty a few short years after the fall of the Ottomans in the early 1930s. This is important to internalize for two profound yet ironic reasons. One of the core principles of the Saudi state today is "to obey the ruler," essentially that one ought to obey and not contest those designated with authority and leadership. The Saudis even theologized this position using selected readings, interpretations and proselytization of sacred texts. This paradigm found impetus in the "Al-Madkhali and Al-Jamia" movement, a subset of the Salafi School. Established by Rabi Almadkhali and Mohamad Ibn Aman Aljami, the movement stipulates that there is no room for challenging the leadership and whoever does so becomes the center of severe reproach and persecution (e.g., Loujain al-Hathloul – the voice of human rights defender), and violent execution (e.g., Khashoggi – the voice of free journalism). This is the backbone of the Saudi family deal with the Salafi religious institution; i.e. paved the way for religion to play a central role in people's lives while guaranteeing full protection of the self-appointed leadership. Paradoxically, it is central to a kingdom's existence that obedience is practiced, yet the founding of the Saudi state was as a result of rebellion against a caliph, respected by Muslims in as far places as the Indo-Pakistani subcontinent; indeed, the Saudi state was founded as a result of contending and betraying governance. In addition, as a result of what we have previously coined "the three prince gamble" between Mohammed bin Salman (MBS), Mohammed bin Zayed Al Nahyan (MBZ), and Jared Kushner, the modern Saudi state has initiated a normalization process with the Israeli administration under the pretext of generating a buffer for the so called Shiite expansionism aspirations. Just as the Al Saud clan betrayed their Muslim brethren at the beginning of the 20th century in their agreements with the British, they repeat the same duplicity at the beginning of the 21st century in betraying the Palestinian cause and making friends with former enemies. Interesting to note that the reasons behind such deviation remain the same, clinging to power whatever the price. Who can deny the central role of the holy lands as the nucleus and sacred cantonment for the Ummah? 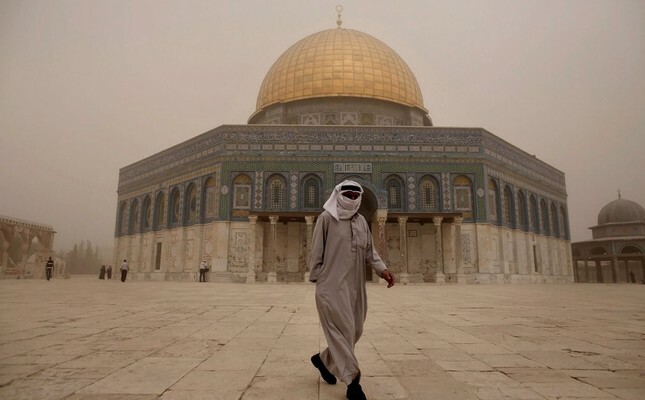 Along with the Haramain or the Grand Mosque in Mecca and the Prophet's mosque and his holy tomb in Medina, the third holy city of Islam is Al-Quds or Jerusalem the religious significance of which is also mentioned in the Quran (e.g. Quran 17:1 and in numerous prophetic traditions). To protect the sanctity of Al-Quds, Muslims throughout history sacrificed a great deal during the crusades. After the second victory of Al-Quds under Salah ad-din al Ayyubi and under the Ottoman rule, Al-Quds signified the epitome of coexistence of three Abrahamic faiths Judaism, Christianity and Islam. However, that is not the case anymore since the establishment of the Zionist settler state and an apartheid structure is now in place which discriminates Arab Muslims and Christians. Because Al Saud, a Muslim family, ruled the holy cities of Mecca and Medina as well as the Hejaz and Nejd regions, there was no attention given to the role of Al Saud in the Muslim-majority world throughout the 20th century, due to Muslims' focus on the colonization of other lands by European imperial powers. It is not surprising at this backdrop that voices among many Islamic organizations, movements, personalities and political leaderships are emerging from the Muslim world calling for the administration of Hajj by an independent body. A Palestinian state cannot be realized if the center of global spiritual Islam is controlled by an entity that trivializes that very cause and even actively works against it, allying itself with the Zionist settlement. Moreover, the noble title of the Custodian of the Two Holy Mosques cannot be allowed to be instrumentalized and used as an immunity card in nefarious activities such as the killing of Khashoggi. We do not argue for a specific solution, though it is possible that power does return to the people in a democratic fashion. The push to democratize would most definitely not come from the United States or its allies, as democratization has only been used as a weapon when the interests of the United States and its allies are not in the oil-rich state's priorities. The ongoing situation in Venezuela is a direct example of when a state is pushed to democratize by the U.S., juxtaposed with an eerie American comfort with kingdom in Saudi Arabia. The Saudis provide oil; the Americans secure the royal throne. It is due to a multitude of betrayals throughout the past century that a reassessment of the Saudi state is required. We argue that the Muslim-majority world's focus ought to be centered on the nuclei of spiritual Islam, Mecca and Medina, where Al Saud acts in the interests of its protectors and in the interests of its own ruling family, rather than in the interest of its people or the international oppressed. The list is long: from inculcating well-orchestrated precepts of radical Islam, retarding progress in all spheres of life, plunging the Middle East and North Africa into a chaotic and unpredictable situation; to sponsoring military coup d'etats; to creating the Yemen humanitarian crisis and killing thousands; to normalizing a relationship with Israel; to the gruesome killing of Jamal Khashoggi; to the inhumane land, sea and air blockade of its Qatari neighbor; and finally to massive human rights abuses and unjust executions domestically, there ought to be no controversy in asserting that Mecca and Medina are occupied territories. If this notion is established with certainty, the entire perspective through which Muslims view the world– the Weltanschauung, will have refocused its priorities.